November 19, 2008 by rwb, under Microcontroller. One of the important features in today’s modern microcontroller is the capability of converting the analog signal to the digital signal. This feature allows us to process the analog world easily such as temperature, humidity, light intensity, distance, etc; which usually captured by electronics sensor and represent it on the change of voltage level. Before building the program first configure the frequency to 11059200 Hz from menu Project -> Configuration Option. Rebuild and down load the program to the AVRJazz Mega168 board by first putting the board in programming mode and select STK500 or AVRISP programmer from AVR Studio 4. For detail explanation of using this board feature you could go to AVRJazz Mega168 Learning and Development Board or Starting Atmel AVR C Programming Tutorial. While running the program, the 8 blue LEDs start to shifting back and forth to the left and right; try to adjust the user’s trimport by turning it to the left or right and you could see the speed of LED shifting will vary. 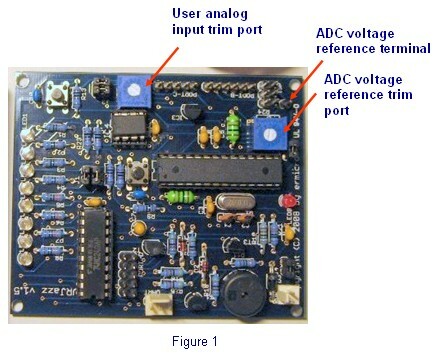 The user’s trimport basically work as a voltage divider circuit and provide voltage input level to the microcontroller analog port (RC0) by changing the trimmer; it will change the voltage input level to the analog port. The function of this register is to control the microcontroller ADC operation such as enabling the ADC feature, start converting, prescaler selection and interrupt control. On this tutorial we will focus on ADEN, ADSC, ADPS2, ADPS1 and ADPS0 bits. When setting the ADEN to logical “1” it’s mean we enable the microcontroller ADC peripheral function; by setting the ADSC to logical “1” it’s mean we instruct the microcontroller to start the conversion. This register is used to select the analog port channel to be used, voltage reference for the ADC operation and the data presentation of the ADC result in the ADCL and ADCH data registers after conversion. We just leave the REFS1 and REFS0 to it’s default value (logical “0“) which mean we use the external voltage reference. The ADLAR bit is set to logical “0“; means we instruct the microcontroller to place the highest 2 bits data conversion in ADLR and the lowest 8 bits data conversion in ADLC register. On the AVRJazz Mega168 board this voltage can be adjusted by using the voltage reference trim port and measure the reference voltage on the voltage reference terminal, the default value is set to 1 volt for 4.5 volt power supply. First we instruct the microcontroller to start the ADC conversion by setting the ADSC bit in ADSCRA control register to logical “1“; then we just wait for this bit to turn off (the C while statement). The microcontroller will automatically turn this bit off after ending the ADC conversion. The ADC conversion result will be placed in these two 8 bit ADC data register. It’s need two 8 bits data register to hold the result; because the Atmel AVR ADC circuit used 10 bit resolution. Which’s mean the first lowest 8 bits will be placed in the ADCL register and the remaining 2 bits will be placed in the ADCH register (assuming we use the default ADLAR value of 0 in the ADMUX register). At last the remaining program; we just call the _delay_ms() function with the argument of iDelay variable before displaying data on PORTD (the LED), therefore the LED delay is depend on the ADC value. 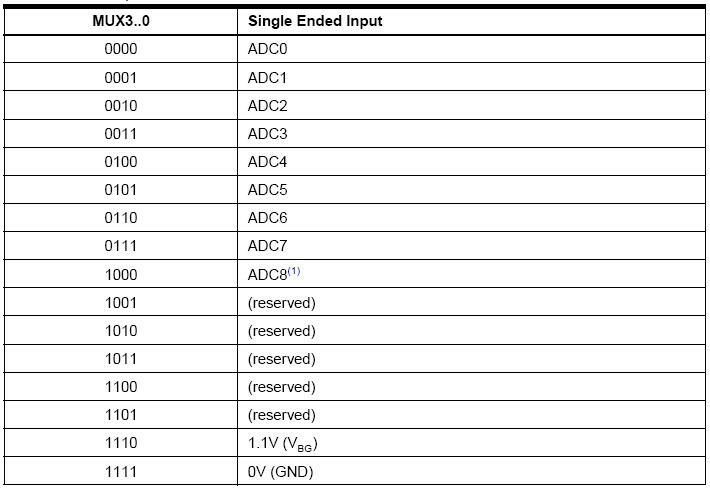 For further information about the ADC peripheral on Atmel AVR microcontroller please read the Atmel ATMega168 datasheet. wow. thanks for the incredible tutorial. i really found it interesting and useful. in what IDE do you write code ?